It's difficult to live up to a title like “the father of African cinema” but Ousmane Sembene never shied away from a challenge. Sembene blazed his own trail from a grade-school dropout in the Casamance region of Senegal to sharpshooter in the French colonial army to semi-literate dock worker in Marseilles to published novelist en route to becoming one of the world's most celebrated filmmakers. Whether or not Sembene was truly the first sub-Saharan filmmaker to shoot and release a film theatrically – Beninese/Senegalese director Paulin Soumanou Vieyra has a valid claim on that distinction – he was indisputably the major voice in African cinema in the years immediately following independence (1960 for Senegal). Critics may have applied the label “The father of African cinema”, but Sembene embraced the responsibilities that came with the honor: “I am the eyes and ears and voice of millions of people.” He viewed his mission as vital (“If Africans do not tell their own stories, Africa will soon disappear”) and remained clearly focused on his homeland even as he won ever-greater praise on the international film circuit: “Africa is my audience; the West and all the rest are just markets.” His career spanned forty years and tackled controversial issues such as the complicated role of Islam in Africa, the exploitation of African soldiers by the French colonial government, and the horrors of female genital mutilation. His boldness led to struggles with both censorship and financing, further exacerbated by his open embrace of the Marxist influences that shaped his (self-)education. Sembene's debut short film, “Borom Sarret” (“The Wagon Driver”, 1963), adapted from his own short story, reflects Sembene's class consciousness in part through a protagonist who doesn't share it. The titular wagon driver (non-professional actor Ly Abdoulay) identifies more with his partly-mythologized ancestry than with his fellow citizens as he makes his daily rounds through the streets of Dakar on a cart driven by a horse named Albourah (the driver, unlike the horse, doesn't get a name). In voice-over narration, the driver complains about the cheapness of his various riders, looks down (literally, from a high angle shot) on a crippled beggar, and fails to sympathize with a man whose child has just died. Their problems simply aren't his. He is, however, seduced by the ostensible trappings of success: first, by a charming griot (a traditional African storyteller/musician) who flatters with beautiful stories of a heroic past, and then by a nattily-dressed businessman who cons our hero into a free ride. In this first screen outing, Sembene displays an obvious affinity for Italian neo-realism, most overtly by having the driver wear a fedora similar to the one featured in Vittorio de Sica's “Bicycle Thieves” (1948). “Borom Sarret” observes the driver's daily routine in great detail and paints a vivid portrait of a Dakar divided into the “white” section of gleaming modern buildings high on a plateau and the lower elevation “black” area of dirt roads and wooden homes. The driver's constant bellyaching does not lead to any cathartic epiphany, with the final scene promising little hope for a newly-independent Senegal that is not, in Sembene's view, particularly close to actual independence. Shot a few years later, Sembene's debut feature “Black Girl” (1966), also adapted from the director's own story, displays an evolution in style. 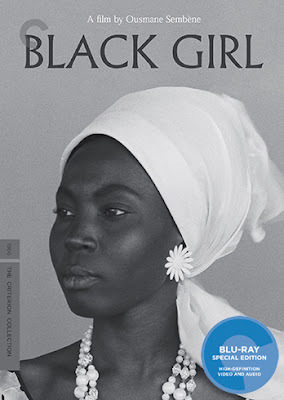 Though it's another film about the daily life of a working class protagonist, “Black Girl” displays a formal sophistication that points straight to Sembene's training at the prestigious Gorky Film Studio in Moscow. Title character Diouana (M'Bissine Therese Diop, a teenage seamstress and art student making her film debut) arrives in France from Senegal for a new job that doesn't match her naïve fantasies. Back home in Dakar, she was delighted to work for her white bosses, dancing in celebration near her home after being “selected” at a street market, and reveling in the opportunity to care for the couple's children. Diouana interprets an invitation to return with the couple to France as something between a promotion and a vacation, but soon learns that in “The Promised Land” (the English title of Sembene's short story) she is seen as nothing more than “the black girl” or, more properly, as “the black girl of...” (“La noire de...) indicating her status as property. 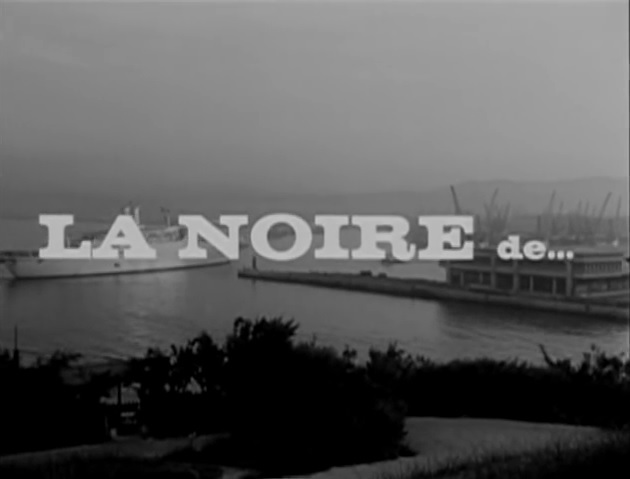 Sembene deftly emphasizes Diouana's isolation; she marvels at the beautiful Riviera beach through the window of the car that whisks her to her new home. Once there, she will continue to see the beaches only through windows as her world shrinks to little more than the kitchen and bathroom where she cooks and scrubs for the increasingly imperious Madame (Anne-Marie Jelinek) and the generally clueless Monsieur (Robert Fontaine). Nimble shifts from low to high-angle shots establish the hierarchical structure, but Diouana's refusal to be comfortably framed by this set-up suggests that its foundation is crumbling, a sense augmented by the journey of a traditional African mask from Senegal to France, then back home. “Black Girl” provides the first evidence of Sembene's keen interest in the plight of African women. He once stated that, “When women progress, society progresses” and that if they do not, society cannot. 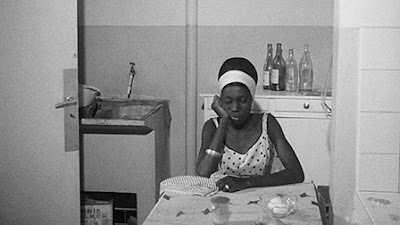 That argument is somewhat difficult to square with the events of “Black Girl,” but Sembene definitely turns “the black girl of” into a full-fledged character with agency and a developed inner life, related both in French voice-over by Haitian singer/actress Toto Bissainthe and by Diop's expressive face in strategic close-ups. “Black Girl” won the Prix Jean Vigo, and if it didn't quite sweep across a continent (Sembene often bemoaned the miserable state of film exhibition in Senegal and other nearby countries) it announced the full emergence of an eloquent new voice in world cinema. For a brief period, Sembene was viewed more or less as the global representative of all of African cinema, which, of course, wasn't accurate at all. Thanks in part to his pioneering efforts, other great directors like Djibril Diop Mambety and Safi Faye (among many others) soon made their presence known, and Sembene would have to settle merely for being “the father of African cinema” instead of all of it. The old New Yorker DVD wasn't bad, but this high-def transfer from a restored print represents a significant improvement. The brighter spots in the B&W film looked washed out in the old DVD, but that's not a problem here at all. Grain structure is subtle and pleasing, and the image quality really shines in close-ups. The linear PCM mono track is clean and efficient if not particularly dynamic. The music, a contrast of jaunty French piano tunes and African kora music, is treated well by this mix. Optional English subtitles support the French audio. Criterion has come through in a big way with a diverse array of substantive supplemental features on this new Blu-ray release. “On Ousmane Sembene” (2016, 20 min.) features an interview with scholar and Sembene biographer Samba Gadjigo. Gadjigo has written or edited multiple English-language books on Sembene while also co-directing the documentary “Sembene!” (2015). He brings his expertise to this concise interview which provides historical background regarding filmmaking in Africa under French colonial government along with more biographical background on Sembene's journey from Casamance to global fame. “On Black Girl” (2016, 21 min.) features an interview with scholar Manthia Diawara, who also directed a documentary on Sembene included on this disc (see below). Diawara emphasizes Sembene's interest in highlighting the struggles of African women, while also analyzing some of the film's major themes. “Black Girl” fans will be thrilled to catch up with lead actress M'Bissine Therese Diop in this new interview (2016, 12 min.) She mostly repeats information she has shared in interviews previously, including that she had little interest in acting at the time and at she (a part-time dressmaker at the time) designed most of her own clothing for the film. Diouana has become such a legendary, defining character in African cinema it's always exciting to see the woman who brought her to life. It's not much, but the “Color Sequence” (1 min.) finally provides an opportunity to see the scene once believed lost – when Sembene shot in color as Diouana looks out the windows of a car and sees France for the first time. Restored here by the British Film Institute. “Borrom Sarret” (1963, 20 min.) is included as an extra, but should be considered simply as one of the two primary films on this release. The menu option for this short film also includes another extra, “On Borom Sarret” (2016, 12 min.) gives Manthia Diawara another opportunity to provide context and analysis. The heftiest extra on the disc is “Sembene: The Making of African Cinema” (1993, 60 min. ), a documentary directed by Manthia Diawara and Ngugi wa Thiong'o. It's fun to see directors like John Singleton show up, but no doubt the central draw here is seeing Sembene in action at festival appearances or holding court for young, aspiring filmmakers at his Galle Ceddo home. Another brief highlight is Sembene discussing his fondness for Charlie Chaplin, who he once met. The slim fold-out insert booklet includes an essay by critic Ashley Clark. Off-hand, the only other African films I can think of in the Criterion Collection are Djibril Diob Mambety's “Touki Bouki”and Ahmed al Maanouni's “Traces”, both part of the “Martin Scorsese's World Cinema Project” box set. “Borom Sarret” and “Black Girl” have both been restored by World Cinema as well. Here's hoping there are many more African films to come. As for this Criterion release, it does justice to Ousmane Sembene, one of world cinema's greats.